William Paterson University’s Cotsakos College of Business— one of an elite group of business colleges to achieve international accreditation from the Association to Advance Collegiate Schools of Business (AACSB)—offers a variety of challenging and rewarding degree paths to prepare you to excel in today’s global business environment. 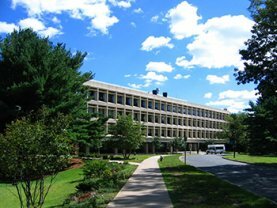 Located in the state-of-the-art building at 1600 Valley Road, the College offers undergraduate programs in accounting, finance, financial planning, global business, management, marketing, professional sales, and economics. Graduate students can pursue the master of business administration (MBA) with a choice of concentrations in accounting, entrepreneurship, finance, management, marketing, and music management. In the Cotsakos College of Business, you will study in small classes, taught by faculty who are recognized experts in their fields—often with significant industry experience. Gain real-world experience through internships, credit-earning practica, job shadowing, and mentoring programs—all designed to prepare you for a meaningful and productive career upon graduation. You can also benefit from the College’s sophisticated resources including the Financial Learning Center, an active trading room that brings the world financial markets to campus, and the Russ Berrie Institute for Professional Sales with its Professional Sales Laboratory.